I have a couple screen shots that I think say it all. I have noticed that my CPU is getting extremely heavy usage when doing simple editing in VS under the new R#6. This was not an issue with 5.1. The first shot is just my CPU meter, and the second is Process Explorer's thread view, showing a pile of .NET threads working very hard. that's when I get the 70%+ CPU usage. Seems extremely heavy for something like that. Is this expected? and upload it to ftp://ftp.intellij.net/.uploads/? in VS under the new R#6. This was not an issue with 5.1.
something like that. Is this expected? Ok I ran into some more serious perf issues and uploaded a profile to the ftp. Let me know if you need any more samples, happy to help! Thank you! You can track the progress here: http://youtrack.jetbrains.net/issue/RSRP-273872. in order to speed up typing. the ftp. Let me know if you need any more samples, happy to help! I am also seeing similar issues. Performance used to be acceptable under R# 5.X, but it is now almost unusable. under R# 5.X, but it is now almost unusable. I have a similar issue with Resharper 6. I am running a twin core (2GHZ) Sony Viao with 8GB of RAM with Visual Studio Team System 2008 SP1. My machine at home has no problems. It is overclocked to 4GHZ. My colleague with a Quad core 2.3GHZ and 4GB RAM has no problems. 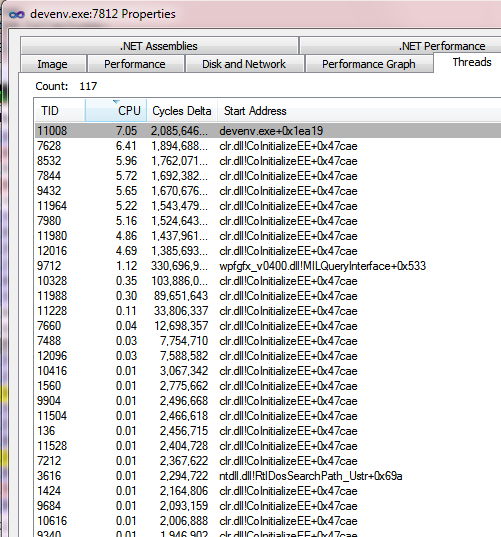 Are there any procedures to switch off parts off Resharper to try and identify the source of the CPU problem? shortcut) to check if this eliminates the perf problem. on a cs class page. colleague with a Quad core 2.3GHZ and 4GB RAM has no problems. identify the source of the CPU problem? Thanks for your suggestion re Ctl-Alt-Shift-8 to switch off code check on current page. However I have dropped back down to V5 for now as I am under the cosh to get stuff done. I will see if I can do some tests over the weekend.